House Votes To Give FDA Control Over Tobacco After more than a decade of debate, federal oversight of the way cigarettes are made and sold appears closer than ever. The House approved a bill Thursday giving the Food and Drug Administration jurisdiction over tobacco. 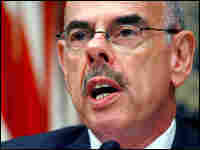 Rep. Henry Waxman (D-CA) sponsored the bill that the House approved Thursday giving the Food and Drug Administration jurisdiction over tobacco. After more than a decade of debate, federal oversight of the way cigarettes are made and sold appears closer than ever. The House approved a bill Thursday giving the Food and Drug Administration jurisdiction over tobacco. The FDA would have the power to change the ingredients in cigarettes, dictate bold new warning labels and prohibit adjectives like "mild" and "light" that could mislead smokers. But the bill stops short of allowing the agency to impose an outright ban on tobacco products or nicotine. 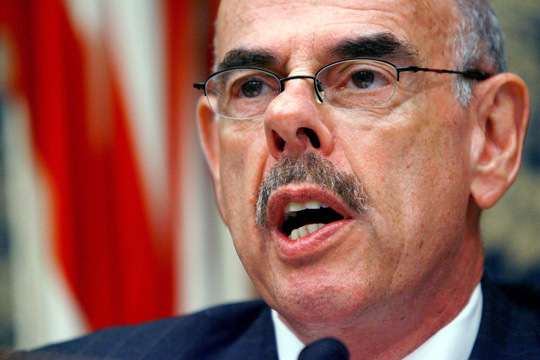 The bill's sponsor, Rep. Henry Waxman (D-CA), says the oversight is long overdue. "While it is an inherently dangerous product — because it's the only product when used as intended, kills and makes people sick — it is not regulated," he says. The FDA tried to regulate tobacco during the Clinton administration, but in a drawn out legal battle, the Supreme Court ruled in 2000 that only Congress could give the agency that authority. Ever since, the industry's supporters in Congress have blocked attempts to give the FDA that power. Now, the nation's top cigarette maker, Philip Morris, supports regulation. But other firms say it will stifle development of safer tobacco products and chill competition. Rep. Virginia Foxx is a Republican from tobacco-growing North Carolina, home to the country's No. 2 cigarette maker, Reynolds American. "The bill is a de facto prohibition of tobacco," she says. "It's going to legislate a big tobacco monopoly. This bill is going to increase taxes, expand government bureaucracy at the expense of public health." "For the first time, tobacco will be regulated like any other product that you ingest in your body in this country," says Daniel Smith, president of the American Cancer Society's Cancer Action Network. "This bill will help keep tobacco products away from kids, it will require [the manufacturers] to do ingredient disclosure and it will give consumers basic information they need and actually stop the tobacco companies from misleading the public." "The bill as it's currently drafted is obsolete," says Stan Glantz, a professor and director of the Center for Tobacco Control Research and Education at the University of California, San Francisco. He says the bill doesn't reflect the results of the 2008 election. "It would be like at the height of the Bush administration, some environmental groups had cut a deal on global warming with the oil industry figuring it was the absolute best they could do," Glantz says. The most troublesome provision, he says, puts two nonvoting tobacco industry members on the scientific advisory board that will oversee the FDA's tobacco rules. "If we have learned one thing in the last 20 years, it's that putting tobacco industry representatives on scientific committees is a bad idea," Glantz says. The debate now moves to the Senate, where its main opponent is North Carolina Republican Richard Burr. He says the FDA is the wrong agency to regulate a dangerous product. "It's foreign to the mission of FDA, which is to prove the safety and efficacy of the products that they regulate," Burr says. "More importantly, at a time where they're challenged to meet the standard for food safety in this country, I don't know why we would overload them with a new responsibility." Burr is sponsoring a bill to create a separate federal agency to regulate tobacco. But the proposal has little support in the public health community. Smith, with the American Cancer Society, is optimistic this will be the year Congress passes the FDA tobacco bill. "While Sen. Burr can threaten a filibuster, what matters in the Senate is if you have the votes," Smith says. The bill had more than 60 co-sponsors in the Senate last year, including now President Obama.